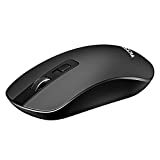 Sometimes you come across a product and you think to yourself, “why on Earth did it take me so long to realize that I needed this?” Such is the case with the VicTsing 4-Button Slim Silent Wireless Mouse, which is only $9.99 right now on Amazon. It’s just like the wireless mouse you’re using right now, but there’s one key difference: It doesn’t make that annoying sound when you click it! Sensitive and Noiseless: Quiet clicks free your worry about bothering other beside you and keep you focused while working or studying. The optical laser allows for quick response, precise movement and smoother tracking. Skin-Friendly for Comfort: Streamline design with anti-fingerprint and sweat-resistant finish offers your hand maximum support and comfort. The sturdy anti-slip rubber scroll wheel ensures that your hand will not slip when scrolling. Stable and Anti-Interference: 2.4GHz wireless transmission technology provides a powerful and reliable connection up to 33ft (10m). 3 adjustable CPI levels, 800-1200-1600, easily change the mouse sensitivity to match your activity. Energy Saving: Powered by 2 AAA batteries. With short-circuit protection and independent power supply function, this wireless mouse with separate switch button can still work with 1 battery. It would enter into power-saving mode in 10mins of inactivity. Well compatible with Windows7/8/10/XP, Vista7/8 and Linux etc.